Right off the exit at 75 and Austin Landing, next to Field and Stream. With all your choices for casual dining in the Dayton area, make quality the standard for your next meal--make BJ's Restaurant & Brewhouse your destination. Thanks to our extensive menu, there's a flavor here for everyone. We offer innovative and refreshing craft brews perfectly paired with your meal. To make your dining experience complete, our team strives to provide quick and accommodating service. Enjoy a meal with us at BJ's Restaurant & Brewhouse in Miamisburg, OH to discover how we're pursuing amazing! 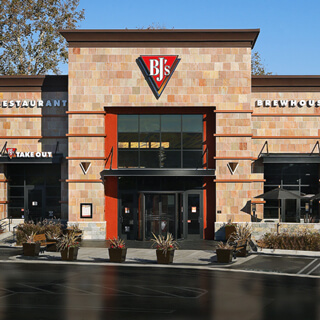 At BJ's Restaurant & Brewhouse, there's something for everyone to enjoy. For the extra hungry in your family, start with one of our incredible shareable appetizers or starter salads. Then, dig into one of our famous BJ's deep dish pizzas, handcrafted burgers, or pasta favorites. We even offer our smarter portioned enlightened entrees, a full kid's menu, and gluten free options. Make sure to save room for dessert--you'll love our renowned pizookie! At BJ's Restaurant & Brewhouse, we're happy to feed the greater Dayton and Miamisburg, OH areas. What could make a satisfying BJ's meal even better? Choose the perfect pairing from our selection of in-house craft brews. Our ten favorite beers are always on tap while we spice things up with our seasonal beers and award-winning specialties. Venture out of the ordinary with the robust PM Porter® or refresh yourself with the smooth LightSwitch Lager. If you're craving quality, award-winning craft beer, you'll be happy you celebrated with us at BJ's Restaurant & Brewhouse. Whether you're looking for cold beer on a hot Ohio summer day or a hot meal in the Midwest winter, you'll find it your new favorite at BJ's Restaurant & Brewhouse. Discover a new usual or try a variety of incredible meals from over 120 items in our menu! Whatever the occasion is for your meal out, come celebrate with us at BJ's Restaurant & Brewhouse near Dayton, Ohio. Our restaurant is the premier spot in Austin Landing. One of the first restaurants here and still the most popular. The team is well known by the community and fosters only the most raving fans.